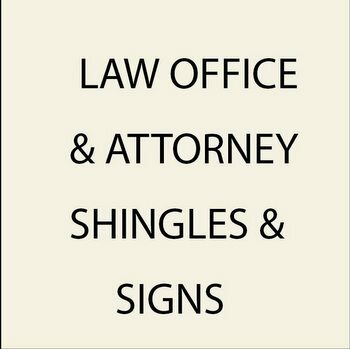 This section of Gallery 10 shows signs and shingles for attorneys , lawyers and law offices for one or two or attorneys. Signs for Law offices that have several attorneys (directory signs, changeable name signs, etc) are shown at the bottom part of this page, page 1. To see 250 sandblasted, engraved, carved 2.5D, or premium carved 3D High-Density-Urethane (HDU) and wood signs and plaques for attorneys, law offices, prosecutors, judge chambers and courtrooms, please click on Gallery 10 - Attorney , Law Office, and Courthouse Signs and Plaques.